Over the last 15 years I've been involved in writing bits and pieces. In reports and publications I've played a part. "So What Is Inclusion" has provided an opportunity to develop these ideas and give a fresh look at what we have learned so far on our journey. It's amazing but in some ways we have been ahead of time! Certainly we have recognised for a number of years that training delivery around disability equality needed to reach a good standard to be effective and that the delivery has a number of complex principals that underpin it. Secondly we have always felt that the various models of disablility needed to be built with learners in order to take ownership and make effective use of models in practice. Inclusion has probably been described most effectively by Pierpiont & Forest. Within this publication I haven't found anything particularly new of itself, people have always been included and excluded and we can all identify when it has happened to us, the problem is when exclusion becomes discriminatory and negates our human rights to belong and participate. 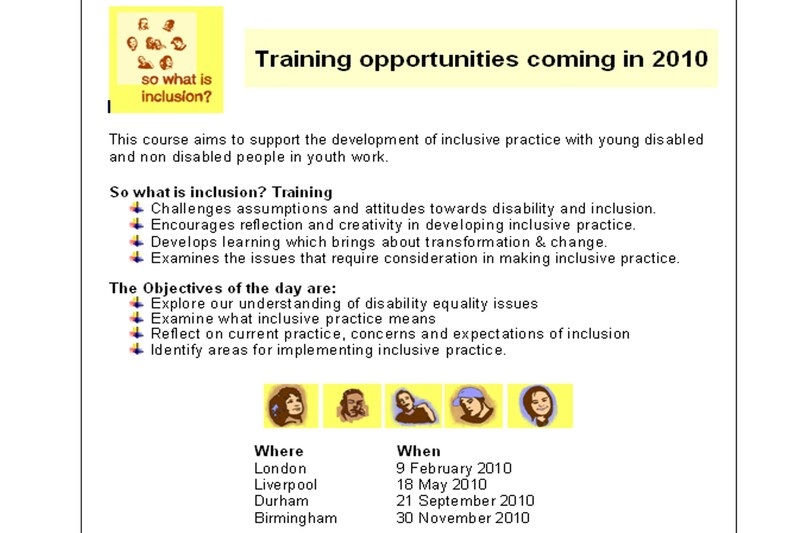 Maybe this resource will help to clarify what inclusion is within the context of youth work and informal education. Perhaps the notion of the journey planner & the 7 Landmarks have contributed to what needs to be considered to make inclusion a reality. My understanding of inclusion is seen in all my life, and although my site is split between work & fun, they inform each other. Without one, there would not be the other. UK Youth works out of Avon Tyrrell, one of the best Outdoor Education Centres around and where I learnt to take responsibility, along with Bendrigg Lodge, where I have experienced real challenge and inclusion, and of course Felbury House, where I grew up!